It feels good to do something different, something off the cuff . Last weekend I drove 220 Miles to a town I’d never been to, to hang out with people I didn’t know, and sleep in a tent for 3 nights when the weather forecast was snow. 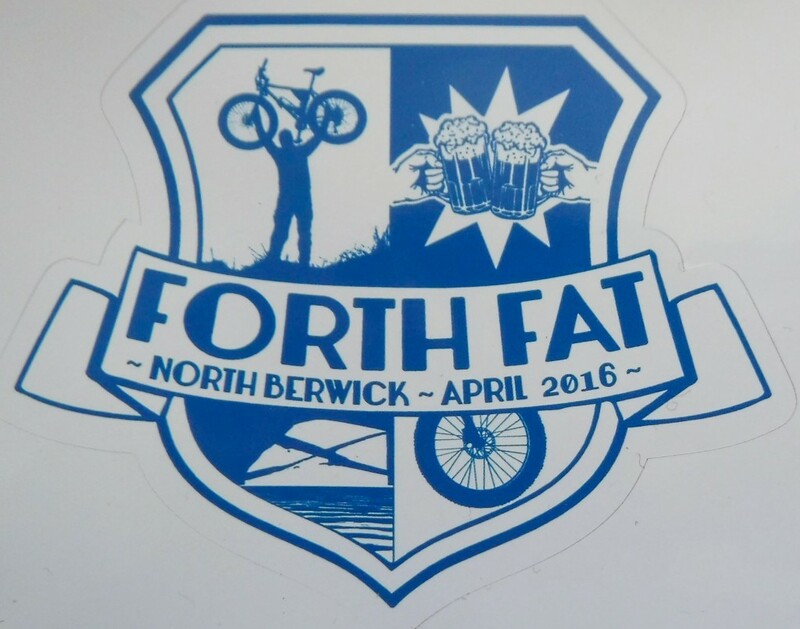 Well, I went to the Forth Fat 2016 gathering. 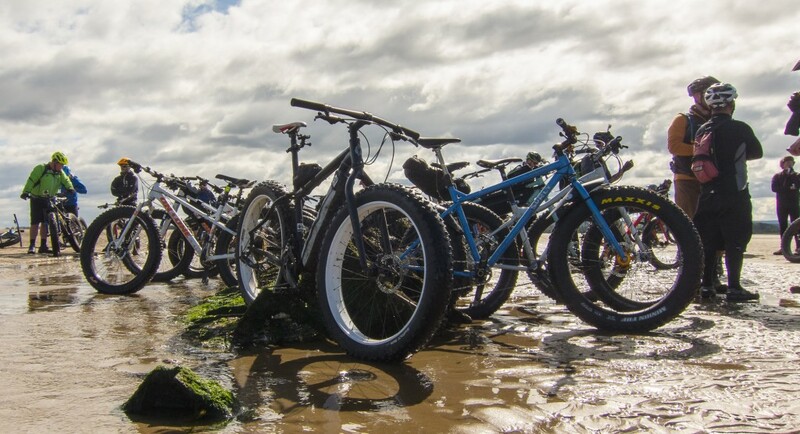 Scotland’s fatbike festival held annually in North Berwick. 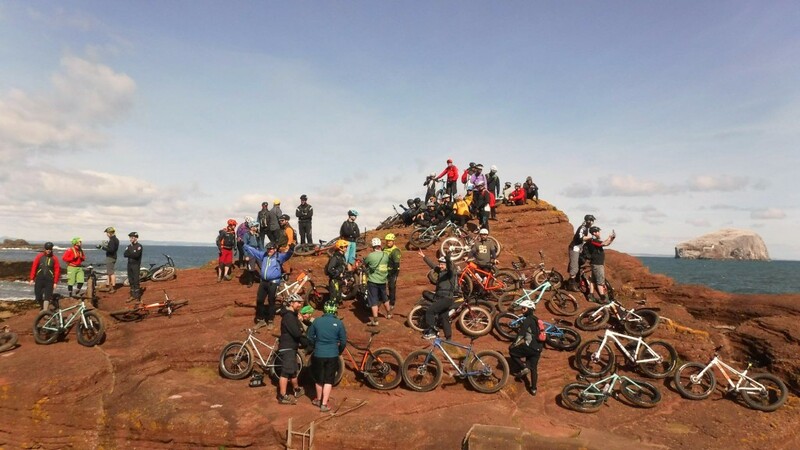 The festival has run for a number of years and is organised by Bruce Mathieson, a fatbike and coast-riding guru. I wasn’t quite sure what to expect, but I thought “why not” as last year’s visit didn’t happen. I ended up being admitted hospital instead. The Forth Fat attracts people from all over the UK, and this year there were attendees from Europe. It’s a social gathering, with organized bike runs and events. There’s also the opportunity to enjoy real ales and local cuisine. Did I also mention that Surly USA and their UK distributor attend every year ? My schedule for the weekend was 3 nights camping, 3 nights socialising and 3 days out on the bike. This wasn’t a bush-biking adventure. It was car camping. I packed accordingly. 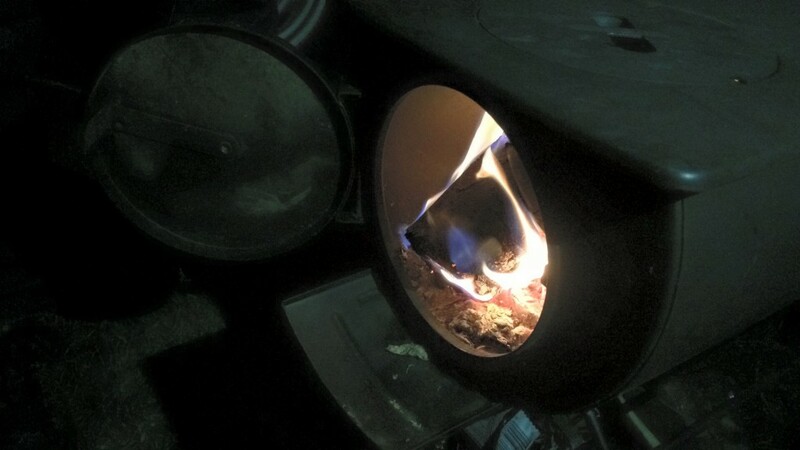 With clothes, tools, spare parts and my trusty portable log-burning stove complete with enough firewood for the duration, the car ended up being rather full. Friday’s planned 10am departure was quickly scuppered by a couple of phone calls, and an unscheduled visitor. Eventually, I got on the road at 12:00. Once underway, driving down was pleasant and uneventful until I reached North Berwick. The GPS showed me driving in the middle of a field, yet there I was, clearly driving on the road. I took a mental note to update the GPS software. Not to worry, I followed the road and spotted several fatbikes outside a pub. I was headed in the right direction. A couple of minutes later I arrived at the campsite and proceeded to setup my weekend abode. All rather painless. Feeling a bit hungry, I treated myself to some food before heading to the Ship Inn with my fellow campers. I felt that to be a prudent move. Having never been to a fatbike festival before, my expectation from internet forums was of bearded men in chequered shirts. But that wasn’t the case. There were fatbikers both male and female, from all walks of life and of all ages. And several families with children. A few blokes with beards were in attendance, but I didn’t see any chequered shirts. I got chatting with many people that night, and indulged in some real ale before heading back to camp a couple of hours later. Having seen the weather forecast, I had prepared for the cold. A four seasons sleeping bag, fleece liner, and hot water bottle ensured I had a cosy night’s sleep. 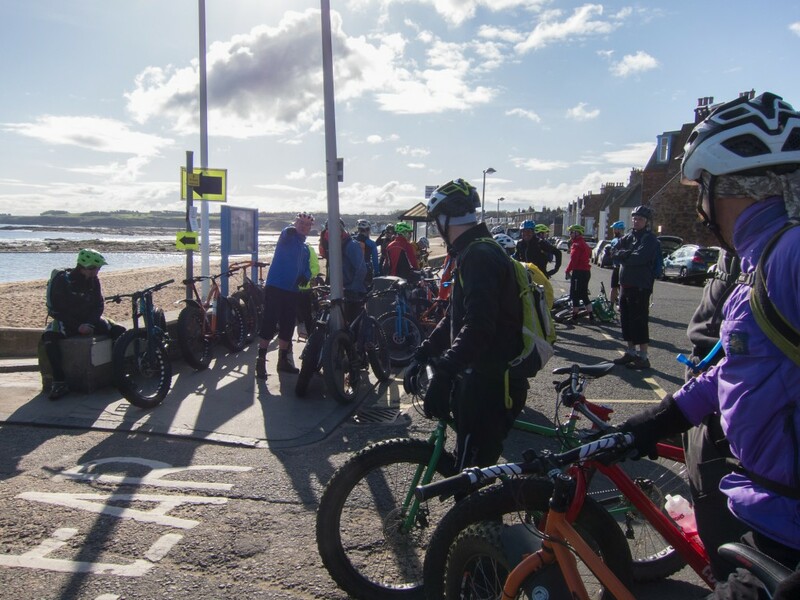 On Saturday morning we cycled to the meeting point in North Berwick. And what a sight it was. A total of 68 fat bikes ready to head out, with another 14 or so joining us at various points. Bruce Mathieson led the way from the starting point. The route took us through some wonderful wooded singletrack, and past a couple of golf courses on the way to Dirleton. We stopped there to let everyone catch-up. Then onward we went, to Gullane past yet another golf course. Bruce advised that there are 32 golf courses in the area. 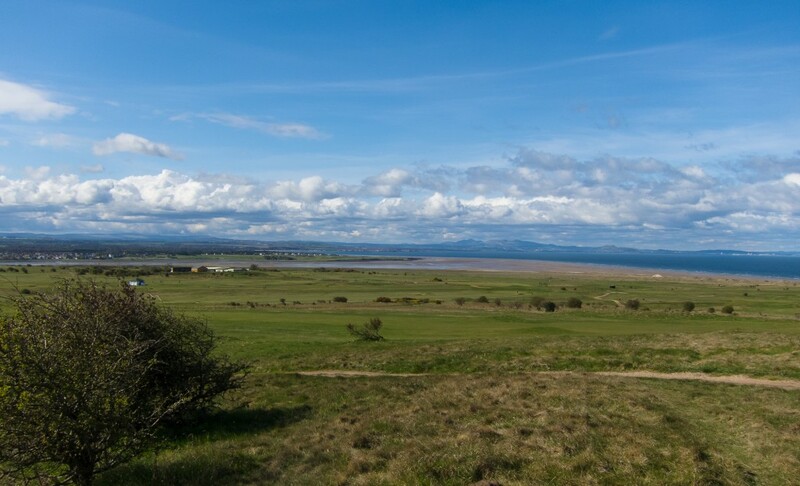 Our next stop was atop the only hill at Gullane. It’s a steep climb, and one which I chose to walk. I was getting quite tired keeping up with the front group. The effort was worth it. We were welcomed by a beautiful view of the Firth of Forth, basking in glorious sunshine and clear blue skies. After a breather and mid-morning snack, the group continued down through the sandy hillside. Soon we arrived at some WW2 anti-tank bollards before making our way through the dunes and onto the beach. Bruce had timed the group to arrive at low tide which enabled us to ride out to the wreckage of some ww2 submarines. This is a Forth Fat tradition. A WW2 submarine makes a good bike stand. According to my GPS track, we were at a distance of about 600m from shore. That’s a fair bit out. The tide comes in at a height of about 4m and I was definitely concerned about getting stuck out there. Especially when my bottom bracket started grinding and creaking. A wee toast and we headed back along the coastline, taking in mixed rocky sections and hard packed sand below the high-tide line. One of my favourite parts is what I call the musical pebbles. It’s a stretch of beach with foot sized pebbles. These pebbles make a beautiful xylophone-like sound when riding the fatbikes over them. Again we took in more hard packed sand, rocky sections, and for variety rode some of the paths over the dunes. Inevitably there were sections of deep,soft sand. At first, I just slid and came to a standstill. But with a few adjustments to my technique I was able to finally ride over these. Result ! The headwind was constant and bitterly cold. I found myself struggling, falling further back among the group. At one point I contemplated the bail-out route. However, the desire to complete the day’s riding overcame that thought. In addition, a guy on a Surly Krampus with his 2-year-old daughter in a child seat was part of the group. If he and the 80 others could do it, so could I. 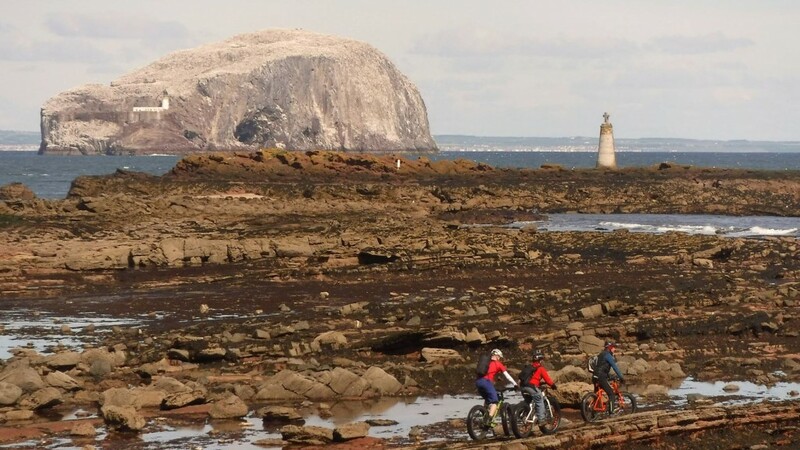 By the time we arrived back at North Berwick, we’d covered just over 19 miles. I was totally exhausted and frozen to the bone. My trusty mountainbike gear, which served me well on inland trails was no match for the unrelenting, bitter cold, coastal wind. The ride was the hardest I’ve done since taking up biking again three years ago. It was much tougher than the 30-mile audax I did two weeks previous. There are no hills to freewheel down. When you stop pedalling, the bike stops. I’d definitely found my limits. At the same time, it was a brilliant experience and genuinely good fun. After a quick shower, it was back to the Ship Inn for fish and chips. Boy was it welcome ! I could have eaten two portions. The food was made even better by the accompanying dark ale. Shortly afterwards I made my way back to the campsite with the others. My leg muscles had stiffened and it was uncomfortable walking. I knew at that point I wouldn’t be cycling on Sunday. It was still bitterly cold. So I set-up the wood burner and got a roaring fire going. I was rapidly joined by several people. A fire is always good for socialising. Pretty soon there was a queue for spaces around the fire. Being next to the van with the beer keg may also have been a good reason. I’m sure one or two people burned their legs by standing too close to the fire all night ! I packed up my tent on Sunday morning and said goodbye to all the new friends I’d made. In typically going home style, the weather was much better that it was the previous day. The sunny drive back was a little more eventful than on the way down. With the GPS maps out of date, it made for some interesting detours around the motorway. What can I say ? A great event, great people, great food, and great banter. I’ll definitely be coming back next year. This time with more appropriate outerwear so I don’t freeze. Thanks to Bruce Mathieson for organising the event, and for contributing photos to this post. Thanks to the unsung heroes who made sure none of us got lost or left behind. And thanks to all the people I met, for making it such an enjoyable weekend. As soon as the current cold snap clears up, I’ll be out on the beaches doing some North East coast-riding. I think I’ve earned my beach wings now. 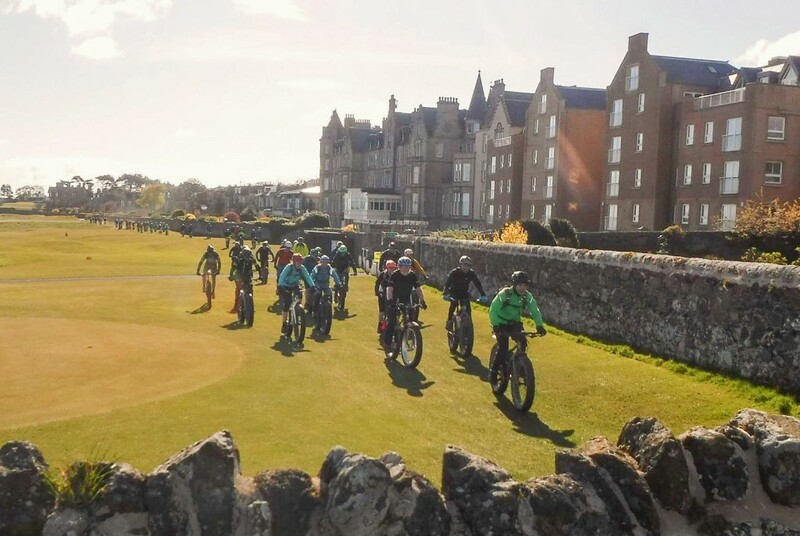 Going to Aviemore this weekend and hiring a fat bike on Sunday, just to try. Planning on doing Ryvoan bothy/An Sluggan circuit. Hoping for good weather. That’s a route I’ve always wanted to do. Weather forecast is not too bad. Get some photos and let me know how it goes. Cheers. Nice write-up Dave. It was great to meet you and to be heated by your stove! See you next time! Or sooner, if you are down. Thanks Scot. Good meeting you too. And I will definitely be down during the summer. Nice to meet and ride with you last weekend. Hopefully we will get a fatbike ride together again. Good meeting you too Jamie. I’ve not been up your direction since I was a teenager. I can foresee a summer trip happening.